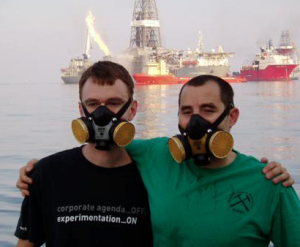 Professors David Valentine and Igor Mezic have developed a new computer model that demonstrates the roles of underwater topography, currents and bacteria in the Gulf of Mexico led to the disappearance of the methane and other chemicals that had spewed from the well after it erupted on April 20, 2010. When Valentine, a geochemist at the University of California at Santa Barbara (UCSB), and his colleagues first published a study in early 2011 reporting that bacterial blooms had consumed almost all the deepwater methane plumes after the 2010 Gulf oil spill, there were lots of skeptics. "There was a lot of doomsday talk," Valentine told the Wall Street Journal. But it turns out "the ocean harbors organisms that can handle a certain amount of input" in the form of oil and gas pollutants. After several trips to the Gulf (see local tv interview), collecting thousands of water samples at 207 locations, Valentine said that after the spill he had found methane gas in amounts 100,000 times above normal levels; then, about 120 days later, he could only find normal concentrations and clear evidence of complete methane respiration. "It seemed that we were putting together a lot of pieces," Valentine said. "There was a transition of the microorganisms and a transition of the biodegradation the water. I knew there was going to be an important water motion component. That linkage might provide that third leg to the stool for this thing to sit right." So Valentine turned to Mezic, a professor of Mechanical Engineering Mathematics at UCSB, who had published results in 2011 forecasting where the oil slick would spread (interview). "The work was on the side of: here's where the oil leaked and here's where it went," Mezic said. He passed on his forecasts to the U.S. Coast Guard and was flown down to the Gulf of Mexico by a company involved in the cleanup. Mezic said, "I looked at this problem and thought there could be a better set of theories to predict how oil will move." Then he got a chance to put his hunch to the test. "David and I agreed that it would be beautiful if we could put a detailed hydrodynamic model together with a detailed bacterial model." It was a complex challenge, . The first step, as reported in the Wall Street Journal, was to estimate the flow rate of the various hydrocarbons from the well over the 87 days that the spill continued. The researchers then identified 26 classes of chemicals; they also figured out which chemicals stayed in the deep plume more than 3,000 feet underwater, and which rose to the surface. Their computer model was then loaded with the hydrocarbon data, and seeded with 52 types of bacteria. Water motion was based on the Navy's model of the Gulf's ocean currents. When they finally ran the model, it helped to explain the mystery of the rapidly vanishing oil spill. One of the key factors was the unique shape of the Gulf of Mexico. Valentine said, "It's like a box canyon. As you go northward, it comes to a head. As a result, it's not a river down there; it's more of a bay." In another location, those bacterial blooms would have been swept away by prevailing ocean currents, but trapped in the Gulf of Mexico, they swirled around at great depths like a washing machine, and often circled back over the leaking well, sometimes two or three times. "What we see is that in water that already been exposed to hydrocarbons at the well and experienced bacterial blooms, and then come back over the well, these waters already have a community in them," said Valentine. "And once they get a second dose of hydrocarbons, they immediately attack." Valentine explains that in the beginning, as bacteria encountered the spill near the well, consuming hydrocarbons (the appetizer course), its population grew until it was swept away by ocean currents. But the water circled back - the Gulf's washing-machine effect - loaded with bacteria and immediately attacked, feasting on the next course of hydrocarbons. These repeated trips to the well (or to nature's all-you-can-eat smorgasbord), by the ever-growing hungry, bacterial herd, devoured the spewing gases. With just a little left over digestive gas. The model had about a 70 percent success rate of hitting where those oxygen declines were. 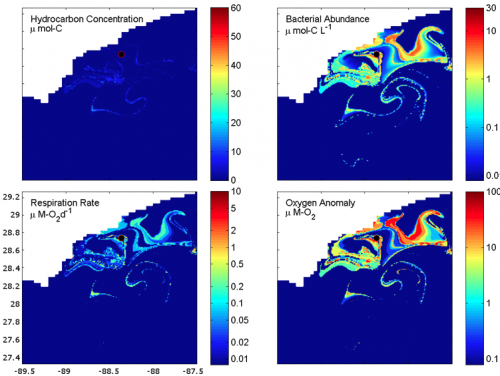 The simulation video below highlights the movement of the submerged gas and oil plume. The location of the Macondo well is shown by a black circle (video above). 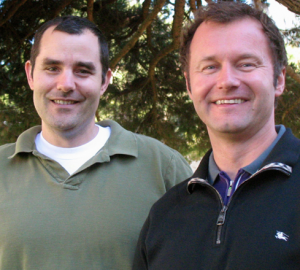 There are valuable lessons to be learned from this study, both scientists said. "It tells us that the motion of the water is going to be an extremely important component in determining how rapidly the different hydrocarbons are broken down," Valentine said. "It gives us the concepts that we can now apply to other situations, if we understand the physics." Should all offshore wells undergo a similar study? Very interesting. 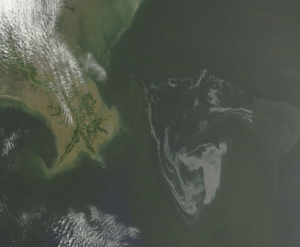 Appears the Gulf spill was a unique case (self-remediating). Curious to know more about the bacteria - types, which are naturally occurring, and how effective were the microorganisms that were added to aid the clean-up effort. Any resources to turn to? Thanks!